Whether you prefer horrifying haunts or a boo-zy bar crawl, the D.C. area has something for you. Check out these events in and around the District. Prepare to get spooked at this haunted house, located inside a former prison in Lorton. Although the Lorton Workhouse is now an arts center, it's been transformed into a creepy attraction for weekends this October. The tour is recommended for ages 13 and up. Attendees should wear sneakers and dress appropriately as the event takes place both indoors and outdoors. Tickets are $20. The Halloween Haunt at King's Dominion offers nine mazes, six scare zones and five spooky shows. New this year is Blackout, a maze that is 99 percent dark... so you'll never see what's coming next. In addition, visitors can watch each night as the Overlord unleashes his minions to terrorize unsuspecting guests in "Overlord's Resurrection." Many of the park's rides will also be available for guests seeking a different type of thrill. With thrilling rides, haunted houses and live performances, Six Flag America's annual Fright Fest promises scares that are not for the faint of heart. New this year are shows featuring mystifying magic, music and dancing, and epic terror. Some programs include "bloody" violence and graphic images, so viewer discretion is advised. If you're interested in "the most horrifying attraction in the D.C. area," you might want to brave Scream City DC at RFK Stadium. Scream City features two haunted houses -- "Exorcism Estate" and "Slaughter Factory" -- that are completely indoors and NOT recommended for children or the faint of heart. Leave kids under 13 at home, as Scream City may be too intense for them. Ticket prices vary from $30 to $40. Parking will cost $10, but RFK is also located blocks from the Stadium Armory Metro station. The makers of Scream City also host events at other locations in Maryland. With four haunted attractions, Field of Screams in Olney bills itself as the "number one scream park" in the DMV. New this year, Ocean City Screams hopes to bring horror to the Eastern Shore with an old cargo ship turned state-of-the-art haunted house. Visitors to this Harrisonburg, Virginia location can take a trip into the Fear Forest, or fight off zombies as they attempt to escape a pulse-pounding corn maze. Tickets are $13 for one attraction, or $18 for admission for both. Because of sudden scares, loud noises, simulated violence and extreme darkness, Fear Forest is not recommended for children under 12 or the faint of heart. The 18th annual Nightmare on M Street bar crawl promises to be "an evening of treats and terror." More than 15 Dupont bars, including James Hoban's and Sign of the Whale, will be offering cover-free admission and seven hours of specials, including $3 Coors Lights, $4 Redd's Apple Ales and $5 Three Olives Vodkas. Oct. 29, noon to 7:30 p.m.
Bar hop through Dupont on Sat. Oct. 29 in this Halloween-themed bar crawl. More than 15 bars -- including The Front Page, Mad Hatter and Irish Whiskey Public House -- will be offering food and drink specials from noon to 7 p.m. Bust out your scariest or most creative costume, because the most festively dressed attendees will win prizes. Tickets are $20, but go up to $30 the week of the event. They'll be $40 at the door. 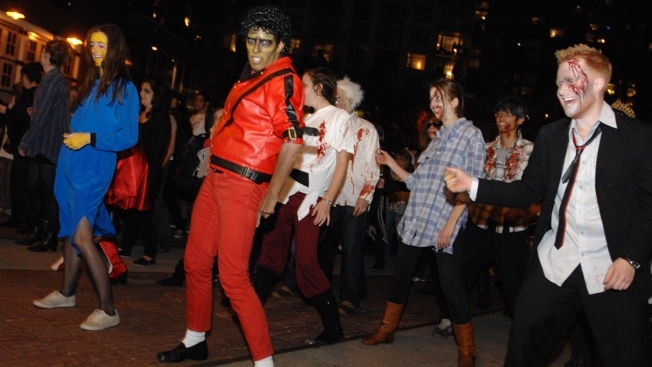 Oct. 28 and 29, 7 p.m.
You can also "trick or treat like a grown up" during Bethesda's two-night bar crawl event. For $20, witches and wizards can enjoy happy hour appetizers and drink specials at five Bethesda bars until 2 a.m. on Friday, Oct. 28 or Saturday, Oct. 29. Tickets also include entry to the Monster Bash after-party and Uber discounts for a safe ride home. Grownups can partake in some fun at the National Zoo's Night of the Living Zoo on Friday, Oct. 28. The party starts at 6:30 p.m. and will include live music, dancing, craft beer and food from D.C. food trucks. You have to be at least 21 to attend this "wicked night of fun." (Sorry, kids -- but hey, there's Boo at the Zoo just for you, Oct. 21-23). Every year, D.C. drag queens show off their elaborate costumes and race down 17th street in this Dupont tradition, coming up this year on Tuesday, Oct. 25. The costume parade starts at 7 p.m., and the race (which, be warned, doesn't last long) begins at 9 p.m., but you might want to arrive early, as this event always draws a crowd. The town of Vienna will be holding its annual Halloween parade on Wednesday, Oct. 26. Kids can walk in the parade to show off their costumes, and the Town Council will recognize the best floats, performers and classic cars at its Nov. 7 meeting. Hagerstown's 91st Alsatia Mummers Parade features floats, local marching bands, classic cars and of course, costumes. The parade will take place rain or shine. Already feeling festive? Enjoy a drive-in screening of "Ghostbusters" Oct. 7 at Union Market. The movie will start at 8 p.m. It's free, but parking will cost $10. Oct. 6, 13, 20, 27 and 31, 7 p.m. The Angelika Pop-Up at Union Market is hosting Hitchcocktober, which will feature classic Hitchcock films throughout the month. Go get terrified by "The Birds" or "Dial M for Murder," and finish Halloween night with "Psycho"! Dress up as your favorite Rocky character and enjoy this iconic movie at Landmark E Street Cinema. The show will be held (as tradition requires) at midnight, on the weekend of Oct. 14-15. This tour through historic Old Town Alexandria is led by guides dressed in 18th-century garb. They'll tell you tales of vengeful ghosts, romance, unsolved mysteries and local folklore. The tour is appropriate for ages 9 and up. Various dates in October; 8:30-11 p.m.
For those who are 21+, take a private White House ghost tour and pub crawl. Your costumed guide will meet you downtown and lead you towards the White House, all the way telling you about ghost sightings, unexplained mysteries and historical events. You will visit up to 4 historically-haunted pubs and can even visit Rum Row and hear stories of Prohibition. Tickets are $28 per person and must be reserved in advance. The whole tour is approximately two and a half hours. Beverages must be bought at your own expense. Various dates in October; 8:30 p.m.
Visit Alexandria in the evening to be privately guided along the waterfront and hear about the haunted history of Old Town Alexandria. During the tour, you'll visit up to four haunted pubs as well as the Carlyle house, one of the oldest mansions in town. Tickets are $25 per person and must be reserved in advance. The whole tour is approximately two hours. The cost of beverages is not included in the ticket price. On this tour, you'll be led through D.C.'s Lafayette Park, also called "Tragedy Square" for its bloody and spooky history. Tickets are $17 for adults and $10 for children. Children younger than 6 get in free. The tour is approximately 90 minutes. On this tour, you'll learn that some of D.C.'s most famous sites are also some of its most haunted. Hear all about ghosts of former lawmakers and presidents. Learn the hidden haunted history of the Supreme Court Building, the Library of Congress, and the US Capitol. Tours are offered nightly at 9 p.m. Tickets are $17 for adults and $10 for children. Children younger than 6 get in free. The tour is approximately 90 minutes. Tour the Congressional Cemetery in this exclusive event. Offered only four nights, this tour will bring you through this historical cemetery to hear just what its residents, from members of Congress to suffragists, have to say. Tours are an hour long; beer, wine and cider will be for sale. Tour-goers are encouraged to bring flashlights and to wear sturdy shoes, as they will be going off the beaten path. Tickets are $20 for adults and $10 for children 12 and younger. Throughout the Halloween season, Scary DC offers both public and private tours through various places in the District sure to spook you. Tour Capitol Hill, Lafayette Square or go on a haunted pub crawl. Go through the haunted history of D.C. with an animated tour guide. Tours are appropriate for all ages. Each tour costs $25 per person, with student discounts at $15. Did you know that the National Building Museum, home to many historical artifacts, has some... unexplained secrets? Tour the haunted building with the lights out to hear more during exclusive tours offered throughout October. Tickets are required and tours are recommended for ages 10 and up. Tour one of D.C.'s most haunted sites, Lafayette Square, and hear all about the ghosts that allegedly plague it. You can meet your tour guide Fridays or Saturdays in October at 7:15 p.m. next to St. John's Church to purchase tickets, or get them online in advance. Tickets are $15 for adults and $7.50 for children younger than 16. Visit D.C.'s most haunted houses in this walking tour, which brings participants to the homes around Lafayette Park as they relive the night of Abraham Lincoln's assassination, hear about Navy hero Stephen Decatur and visit what many to consider the most haunted home in all of Washington, the Octagon. Tours are offered every Friday and Saturday; tickets are $20.